Oh dear, lunchtime reading strikes again. Looking for some quick light reading over lunch I thought to myself that it was time for a little more research into the Guerra del Pacífico, that project I have had on the back burner for a while ((and which interestingly is driving me crazy as I cannot find the 10mm figures I had purchased for it)). Up popped the Naval Battle of Abtao. By the time of this battle, Chile and Peru were in alliance (which also included Ecuador and Bolivia) against Spain. Argentina and Brazil did not join the alliance, partly because they were busy fighting with Paraguay. Spain had sent Admiral Mendez Núñez to South America and he decided to send two of his most powerful ships south to destroy the combined Chilean-Peruvian fleet. The Chilean-Peruvian squadron was under the command of Peruvian Captain Manuel Villar and had taken refuge at Abtao, a well protected inlet near the gulf of Chiloé in southern Chile. The Spanish squadron appeared at the entrance of the inlet on 7 February 1866 but decided not to enter as they did not want to risk their ironclads running aground in the shallows. A cannonade lasting several hours was exchanged with little effect. The Chilean-Peruvian squadron was at anchor and without steam (and it takes a long time to run steam up). Some of the vessels engines were also being overhauled so definitely the Spanish had the Allied fleet in a good position. Had the Spanish been a little less timid they may have won a good victory. However, in spite of the disadvantages, the Allied squadron mounted an energetic fight. The Covadonga, under the command of Lieutenant Manuel Thomson, managed to fire over an island and scored several hits on the frigate Blanca. The battle ended indecisively without further developments. At this point the Spanish withdrew as the long range gun duel was not going to effectively damage anybody. The Esmeralda was not at the anchorage on the day of the battle. The commodore had sailed to Ancud for coaling. 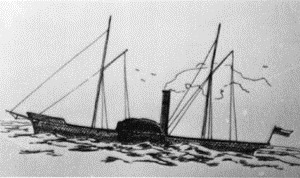 The Spanish squadron however managed to capture the Chilean steamboat Paquete del Maule (pictured above) which was transporting sailors to crew the new Peruvian ironclads Huáscar and Independencia. More on the Guerra del Pacífico and the Guerra Hispano-Peruana/Guerra Hispano-Chilena later. Next Article Rapid Fire – Game 3 – Third Game in the Gun Bar – He Rolled Ones!